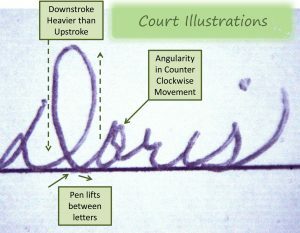 Handwriting, whether in cursive or print, has long been one of the oldest forms of communication between people. The incredible rise of technology in recent years that allows for digital forms of communication has greatly reduced the amount of people who rely on handwritten communication. Some have even wondered if e-mail and texting will spell the end of writing by hand for good. Written messages must be written legibly so that others can understand them. However, a recent survey by CNN found that 33 percent, or one-third, of all respondents had trouble reading their own handwriting. Obviously, this poses problems for the use of handwritten messages to convey important information. Technology has given us many reasons to get away from traditional letters and postcards. Texts can be passed directly between users and reach their destination much more quickly. Spell-check software automatically corrects misspellings, it doesn’t do anything to teach users how to spell a word correctly. Users often aren’t even aware when they’ve misspelled a word if they don’t see a spell-check notification. One British printing and mailing company, Docmail, conducted a study to determine just how often people used handwriting to correspond with others. Not only had one-third of participants gone six months without handwriting one letter, most had digital calendars and other personal assistants, further cutting down the amount of handwriting practice they can get. Handwriting is a lesser used art nowadays, but is still of utmost importance to forensic professionals. Written criminal evidence can be examined and identified as the handwriting of a specific person. But forensic document specialists should also know how to spot forged typed documents. Call Linda Mitchell at the Forensic QDE Lab if you need handwritten or typed documents examined by a forensic specialist.